I am a portrait painter and figurative artist living in Puerto Vallarta Mexico. I paint my friends and acquaintances and include them in scenes of contemporary Mexico. I attempt to paint the beauty and emotion of the people I meet. Every picture really does have a story. I am currently painting portrait commissions, preparing for gallery shows and teaching portrait painting classes. By the time he was 12 years old he was devoted fan of Norman Rockwell especially after the release of My Adventures As An Illustrator, Rockwell’s autobiography. Sometime in 1960 Bill’s mother wrote to the Saturday Evening Post to ask for permission for Bill to send a portfolio of portraits of Rockwell along with some original early Bill White illustrations. The portfolio was sent and came back about a month later with a two-side hand written letter to Bill from the famous illustrator himself. The letter exists today as a reminder of a dream Bill had of becoming an illustrator like Rockwell, and it still influences his painting style today. After a brief stint at the University of Washington art school which featured strange conceptual design classes and a modern approach to art he escaped to the world of commercial art. From 1971 to 1996 Bill White created and operated White Sign and Graphic Design. It was primarily a sign and design shop in Seattle Washington wherein Bill specialized in hand painted signs, graphic design, hand carving, advertising design, ad copy, illustration, caricature and cartooning. Using those self developed skills he produced competent and creative work for a vast variety of clients. His client list goes from mom and pop stores, to a fully illustrated anti-drug coloring book for the Seattle Seahawks, to sign design and construction for the Pike Place Market P.D.A. in Seattle, and finally to Kryspy Kreme Donuts. During those sign painting years Bill was able to hone his skills as a sign designer, many times working with restaurant owners to develop their entire identity package from menu design, to point of purchase signs and posters, to print advertising, to interior and exterior graphic design of the building. The many years of sitting at a sign painters easel stroking letters or hanging off the back of a boat he was lettering taught him a multitude if exacting and expressive brush strokes that apply directly to his style of fine art expression today. William Elston, Peter Malarkey, Mitch Albala, Juliet Aristides and others at the Academy he began producing and showing portrait samples the University Village Starbucks store in Seattle. His shows at the Starbucks flagship store and at the lucrative Bellevue Square store secured him commissions enough to launch his portrait painting career. In November 2005 Bill made the move to Puerto Vallarta Mexico following another old dream. In January he began showing in a gallery . The next year he painted mostly genre and portrait paintings with Puerto Vallarta’s own folkloric dance troupe Baile Xiutla as his main subject. Most were sold as commissioned works to private collectors as well as in the gallery . In January 2006 Bill began painting a total of eleven commissioned portraits of the Bishops and Priests for the main Church of Guadalupe in Puerto Vallarta for display in their future museum. Each season he has a show at the Galeria Loft in El Centro in Puerto Vallarta. 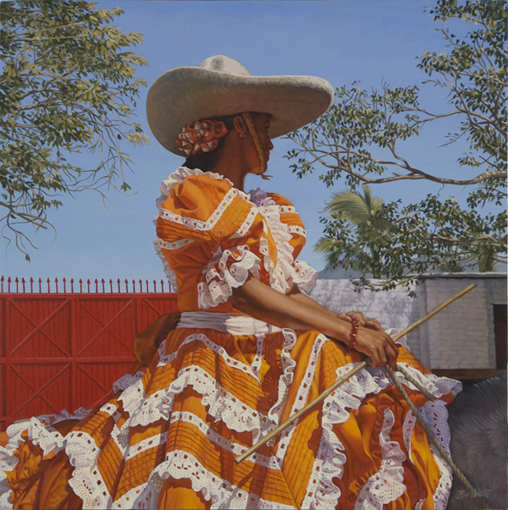 Because of the rich and vivid colors of Mexico Bill White continues to use the folkloric dancers, friends, Charros and Escaramuzas of Mexico as primary subjects of his oil paintings. 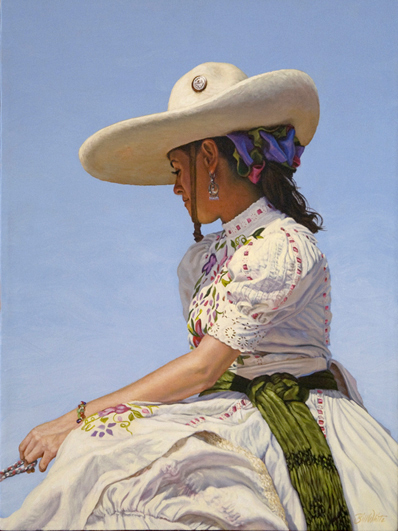 And even though the dream of being a famous illustrator like Norman Rockwell is gone, it has been replaced by a much more satisfying desire to realistically paint the beauty and joy of the people of Mexico.